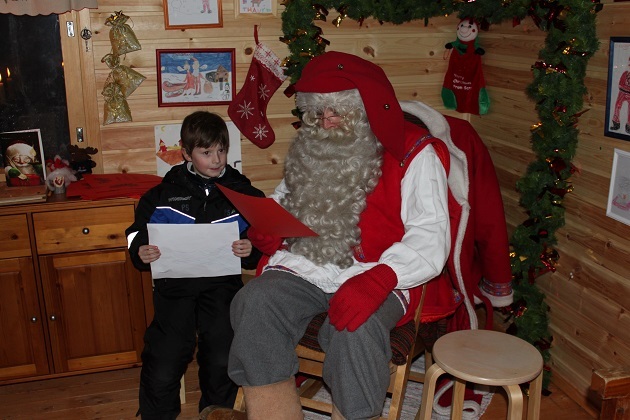 Santa was not the only reason for this Lapland trip, he was however the main one. 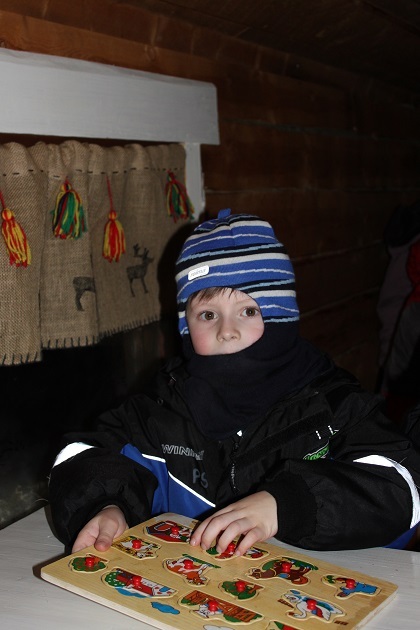 We figured that Son, at 6 was the perfect age for this journey beyond the Arctic Circle – still a firm believer in the man with the red suit but also (hopefully) old enough to retain plenty of memories of this special holiday. Time proved us right on the latter. We planned plenty of snowy activities but also made sure to organise a couple of meetings with Santa. This one at his secret hideaway deep in a forest sounded just perfect. We never normally book tours or take a holiday with a tour operator, we broke both rules here. I was sold on the description in the brochure of seeing the “real” Santa in his log cabin hideaway, we booked and paid for this before we even left the UK. The much anticipated day arrived, we were collected by coach from our hotel in the icy darkness – it was 3.15 pm. A fifteen minute drive out of Levi and into the countryside but not much to see en route. We clambered off the coach and had a walk up a long track at the end of which we were greeted by an elf. She led us up a path lit either side by flickering candles, the magic was starting. Son was spellbound and despite the fairly long trek in some seriously cold conditions, he never uttered so much as a word of complaint – highly unusual. Not sure I was as good as that – the cold was getting to me. 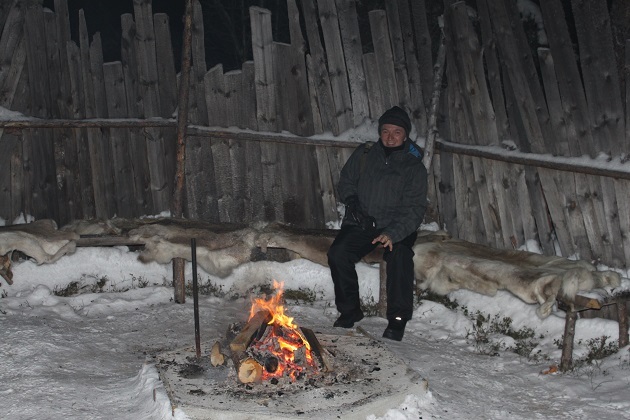 We reached a log cabin set amongst the trees, everyone rushed indoors to warm up by the blazing fire. Flasks of coffee and hot berry juice together with gingerbread cookies hit the spot. A few more elves were inside and they led the group in a sing-song including Rudolph The Red Nosed Reindeer, during which Santa made his appearance. Large, round, jolly every child and quite a few adults were wide eyed with awe. He stayed for about five minutes then left promising he would see us all later. 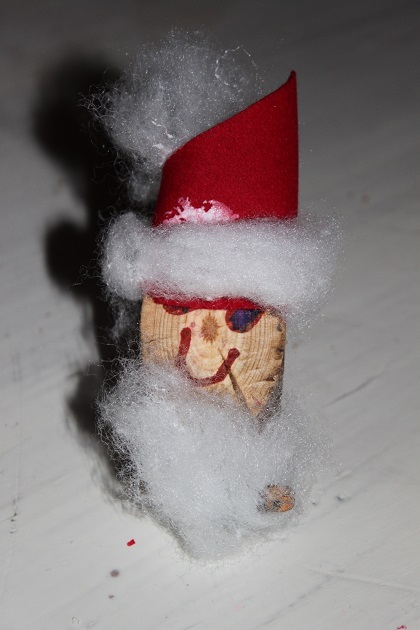 The children were encouraged to draw and colour pictures, there were wooden jigsaw puzzles and a craft area where you could make a Santa head from wood and cotton wool. 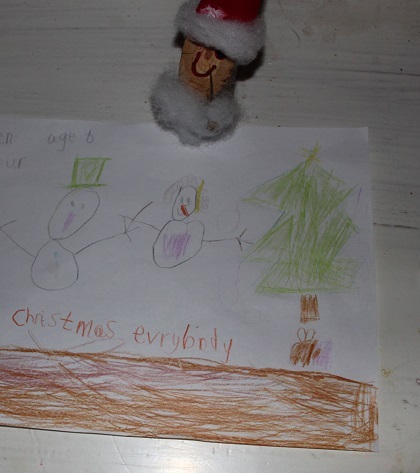 Son’s effort has survived to this day, it comes out every year with the Christmas decorations and takes pride of place on the fireplace. While all this was going on, the tour rep took each family in turn to meet Santa in his special log cabin. First slight bit of pique here from me, I recognise doing this day in and day out is more than a bit boring, our rep however didn’t try to hide these feelings one little bit. The whole thing felt like a production line with the rep intent on getting the job done as quickly as possible. The fact this was a one-off trip of a lifetime experience for most people didn’t seem to have crossed his mind. Son, though, I hasten to add, was blissfully unaware of any of this. Eventually it was our turn, we stepped inside Santa’s cabin and found the most perfect scene – exactly as you imagine it should be. Beautifully decorated, warm and cosy with the most delicious Christmassy smell and Santa seated in his rocking chair. Son was dumbstruck, barely managing to utter his name, he sat beside Santa and just stared. The experience was priceless. Santa was very nice, not overly chatty though and I think the language barrier probably didn’t help with that. Most families were with him for only a short time, this too was our experience. You could take as many pictures as you wanted, no professional snapper either so no pressure to buy anything. They had a few things to do outside the cabins. 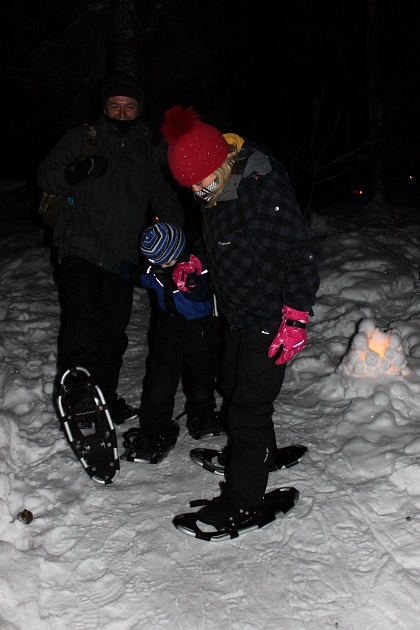 We saw a reindeer, played skittles in the snow and tried out some snowshoes. After all that we sat by a blazing fire and cooked sausages. The whole Santa experience was quite unlike anything we’d ever encountered before in that it was totally uncommercialised. I found that so refreshing. No pressure to buy any extras – there was nothing to buy, we were in the middle of nowhere, this was just wonderful. This brought its own problems though – not least of which there was no running water at the hideway and no toilets – a little tricky. The temperatures were super low and due to the extreme cold you could only venture outside a maximum of ten minutes. It was so incredibly dark with only the light from the fire that I wasn’t entirely happy about being outside anyway – keeping an eye on Son who was inclined to roam was far too tricky. We spent two and a half hours at the hideaway, realistically an hour would have been more than enough. The Santa meeting was wonderful, the activities were fun but for about an hour everyone was crammed into the log cabin just waiting for the coach to come and take us all back to Levi. Eventually it was time, we trudged back down the long path to the bus and then waited while another coach load of people disembarked. Production line and conveyor belt were my thoughts, again this went right over Son’s head. The Santa experience wasn’t perfect. We had to wait far too long in the middle of nowhere in a place with no loos, however time must have dimmed my bad memories. I only remembered all of this when I read my travel journal. Prior to that I thought of this trip with nostalgia and a rosy glow. It is one of the few travel experiences we’ve had where Son remembers every last detail and still, even though at 12 it’s not cool to “do” Santa, enthuses profusely. That probably says it all, the Santa meeting was a hit, in his memory magical in every way and that’s all that matters. I actually forgot the hiccups too to be honest, time passing and all that…. Even with those niggles it was still remarkable and unforgettable and I am so glad we were able to do this. A lovely post for Christmas, thank you and Happy Christmas! Thank you – the perfect place to see Santa!! Happy Christmas to you as well. Absolutely – I forgot about those bad bits as time passed to be honest. It was unforgettable. What a lovely experience!! This really gets you into the spirit of Christmas 🙂 Have a great day! Thank you Lucy – it was the most memorable and fun festive thing!! That was a tricky one!! Worse knowing they weren’t available too, that just never seems to help. But yes, the whole thing was so wonderfully memorable. It was the perfect spot to see Santa for sure. Yes, with time you don’t really recall how dreadful an experience was and I think that’s good to only keep in mind the good memories. It looks like a nice experience. It was great – the niggles in hindsight were only minor compared to the wonderful experience. How lovely that your son experienced all of that magic and wonder and was completely unaware of the shortcomings of the trip. It is always interesting to know which travel experiences stick in the minds of children. I am often surprised by how early some of my kids’ travel memories are. I was amazed how much detail he remembered about all this Laura, it was a very special experience, niggles and all. Wow – I think my girls would freak out if they visited this place! Looks great!! It absolutely is just incredible – almost got me believing in Santa again!! It really is everything you imagine Santa’s hideaway to be – the perfect Christmas trip for sure!! Wonderful that this trip has such special memories for your son Joy and that the wooden Santa will be an annual reminder 🙂 I would have found the lack of bathroom facilities in such a freezing remote place a tad difficult to deal with! The hot berry juice sounds delicious – can’t imagine what it must feel like to be in such cold! Still a wonderful experience despite the niggles! The niggles, now time has passed Rosemary, were only minor – I’m just relieved nobody needed the bathroom though!!! It was such a special experience, not least because meeting Santa is always so commercialised here, this was the complete opposite of that. The cold was challenging, but sitting here in our freakishly mild December I’d swap for a bit of snow anyday!! Yes you would think they would have had a thermal portaloo organised!! Best not to drink too much of the coffee or warm berry juice on reflection! Some strange things happening with the weather at present. Was chatting to my dad earlier and realised that Perth was only a few degrees warmer than Yorkshire today plus the overnight temperatures were similar too. It’s been a much cooler than normal December here unlike the south and east of Australia, which have been having excessive heatwaves (Adelaide has had several consecutive days over 40 degrees!). Apparently daffodils are coming out already in parts of England. Maybe the north wind will start blowing soon! I hope so Rosemary, daffodils in December – not good!! It’s a shame that the tour guide was such a pill! I would imagine that the excitement of the children would be infectious, making it easier to stay “in character”. But as long as Son was unaffected, it’s all good. Really special though no matter what they look like!! We have our collection too – some very dubious ornaments, his earlier efforts but no less precious for all that!! Have a great Christmas Melissa. Thank you! A great Christmas to you as well! It looks simply amazing. And even now, you remember it so vividly. Just shows how special it was. Like the idea of it not feeling commercialised. Most Santa experiences are so commercial here, from the gift shop to the photograph and everything in between. This was so refreshingly different – the children also did not receive a gift from Santa but that didn’t matter to them one bit. Every child I saw was just thrilled to be able to deliver their letter in person without expecting anything in return. Absolutely – and in the end that’s really all that mattered!! Sounds straight out of a fairy tale; I would love to go there myself, forget the kids..hahah!